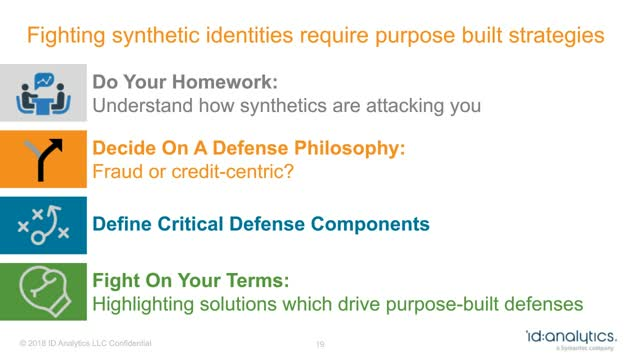 In this on-demand webinar, Kevin King and Carmel Maher from ID Analytics along with Julie Conroy from Aite Group, will provide a comprehensive overview of synthetic identity fraud and discuss the factors contributing to the rising impact of this threat. ID Analytics will share new research findings which outline the key differences between synthetic fraud and traditional fraud and credit risk behavior, as well as describe how synthetics are able to circumvent today’s processes. Synthetic identity fraud is a multifaceted problem, one which has left many lenders feeling helpless. There is light at the end of the tunnel; ID Analytic will share best practices for optimizing your detection and prevention strategy to tackle synthetic identity fraud head-on. Carmel Maher, Senior Product Marketing Manager for ID Analytics presented alongside Deshietha Partee-Grier, AVP Financial Crime Investigations Unit and Sandeep Dhadda, Director, Head of Advanced Analytics for CitiGroup bring the audience to a road beyond the basics of Synthetic Identity Fraud and as they delve into the depth-analysis of mitigating the risks of fraudulent activities through various anti-fraud measures. The prevalence of fraud in the marketplace has remained to be one of the most challenging threats that most businesses face nowadays. Thus, urging companies to stay ahead of the latest fraud-detection measures and technologies to prevent the proliferation of such activities. Among the most pervasive types of identity fraud is Synthetic Identity Fraud which may have accounted for 5% of uncollected debt and up to 20% of credit losses in the past years. Concurrent with the evolving sophisticated fraud tactics, it becomes more important for businesses and organizations to keep themselves abreast of the various strategies and Anti-Fraud measures that will help diminish and significantly slow down the proliferation of Synthetic Identity Fraud cases. Companies must stay updated of the latest threats and developments in this rapidly evolving landscape while minimizing consequences for consumers. Join a panel of key thought leaders assembled by The Knowledge Group as they bring the audience to a road beyond the basics of Synthetic Identity Fraud and as they delve into the depth-analysis of mitigating the risks of fraudulent activities through various anti-fraud measures. Speakers will also provide the audience with best practices, approaches and preventive measures on diminishing such cases. Kevin King, Director of Product Marketing for ID Analytics presented alongside Deshietha Partee-Grier, AVP Financial Crime Investigations Unit and Sandeep Dhadda, Director, Head of Advanced Analytics for CitiGroup on the evolving threat of synthetic identity fraud. What is your mother’s maiden name? What street did you grow up on? We’re all familiar with answering these types of questions to verify ourselves during account opening or access. Knowledge-based authentication, or KBA, has been an industry-standard identity verification / authentication tool for nearly two decades. When initially deployed, it was highly effective and the friction it created was often overlooked because consumer expectations were different. Fast forward to today – its effectiveness has dropped considerably, and the user experience is widely considered egregious because we live in a digital world where instant is the expectation. In this webinar we’ll discuss how the digital transformation is impacting both consumers and enterprises in such a way that KBA can no longer survive. We’ll demonstrate how innovative ID verification helps enterprises reduce their exposure to fraud risk and deliver convenience that meets the expectations of today’s digital consumer. Over the past decade, the U.S. lending market has seen adoption of alternative credit data in underwriting strategies steadily grow. Initially a fringe technology, today the use of alternative credit data to assess applicants without a bureau score from the three National Credit Reporting Agencies (NCRAs) has become mainstream. Yet even with this spike in adoption, the majority of U.S. credit decisions continue to focus strictly on the traditional credit data offered in a typical FICO score. Given this context - what’s the next evolution for alternative credit data in the United States? Which consumer segments and what use cases are the likely next step in lender’s adoption of these powerful and under leveraged insights? Join Jason Heil and Carmel Maher, as they explore the landscape and future state of alternative credit data. For lenders and service providers, protecting their businesses while preserving the customer experience has never been tougher. Fraudsters are growing more aggressive in their attacks, while consumers are growing more intolerant of the friction involved in authentication. In many ways photo-capture technologies present a compelling solution to this dilemma, improving the customer experience by reducing data entry associated with traditional authentication processes. Unfortunately, most of these solutions miss a critical step of verifying the actual identity asserted on the ID. Today, sophisticated counterfeit driver licenses and other forms of government issued IDs capable of defeating document checks are a booming business, allowing fraudsters to pass many image-capture screens. In response, innovative companies looking to leverage photo-capture for authentication are adopting a data-driven strategy that examines both the ID and the identity, protecting their customer experience – and their business. Does your enterprise want to improve your account opening authentication process? How about provide a seamless digital experience when consumers apply at your institution? Digital channel fraud is rapidly evolving, but technology is now available to increase security while reducing friction in the customer journey. Many technologies focus on validating the document a consumer provides for authentication—looking for signs the ID may be fake— yet fail to verify the identity associated with the ID. There are consequences when institutions ignore this gap in authentication. Synthetic identity fraud is on the rise—a recent study from ID:A Labs revealed the fraud rate for synthetic identities has increased more than 100% since 2010. ID Analytics wants to help you better understand how to combat this growing problem.